S SAVHOME Bug zapper is harmless to pregnant women and children because there is very little sound or radiation while working. The mosquito zapper has the advantages of simple structure and reasonable design. It's free of chemicals, poisons, breathable toxins and foul smell. 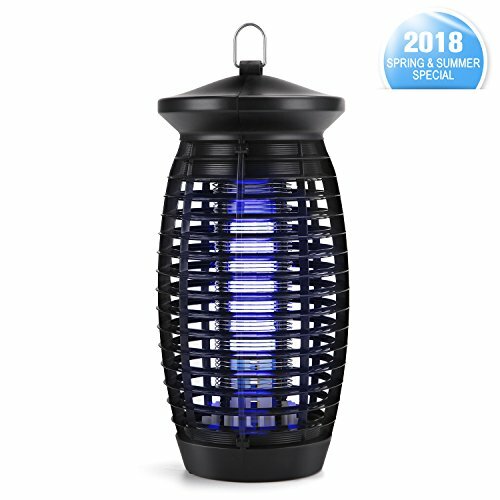 EFFECTIVE FLYING INSECT TRAP - This bug zapper attracts flying insects by emitting high-intensity long wave (365 nm) UV light. Making flying insects such as flies, mosquitos unable to resist approaching, then getting them immediately trapped and killed via the high-voltage charging metal grid. PESTICIDE&CHEMICAL-FREE PEST CONTROL - Working through physical principles, this Electric Bug Zapper is definitely the perfect choice of a chemical-free pest control. Safe for all indoor environment suffering from flying infestation problem. The fly zapper effectively isolates your family from harmful chemicals. LARGE AREA COVERAGE - The 360° all-directional mosquito killer covers a large area up to 500 sq. ft. Protects your family away from the annoying and disease-carrying flies and insects. Perfect for home, office, kitchen, restaurant, etc. EASY TO USE & CLEAN - Just plug and play. This mosquito trap works on 110 V DC, and can be placed or hung for versatile usage. The stylish design makes it a gorgeous lamp as well. Equipped with a detachable tray, fly mosquito zapper can be easily removed for cleaning. 100% MONEY-BACK GUARANTEE - We vouch for our electric zapper's efficiency and durability. Each of our insect zappers is backed by an outstanding 90-day Warranty Policy. If you are dissatisfied with the item, you can return it for FREE and receive a FULL refund. Buy Now And Get The Best Insect Electric Zapper. If you have any questions about this product by S SAVHOME, contact us by completing and submitting the form below. If you are looking for a specif part number, please include it with your message.